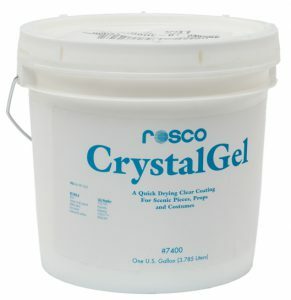 There’s no denying that CrystalGel is a great product. There’s hardly a substrate that it won’t adhere to, and you can always count on it to make a great faux stained-glass window or if you need to mimic the finish of an oil painting. 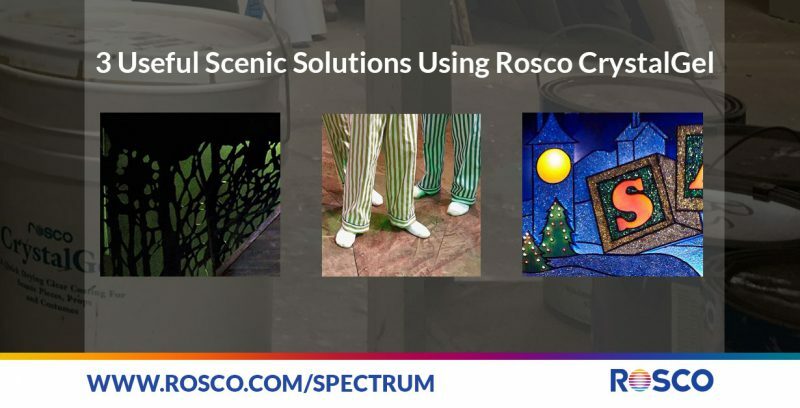 Recently, however, Scenic Artist, Rachael Claxton, came up with three other ingenious ways to put it to work, and she shares them below. Over the past few seasons I’ve gotten the chance to experiment a bit more with CrystalGel in a handful of unique applications, and I’m loving the weird ways I’ve been able to use it. I love finding new uses for products I’ve used for years and there have been three recent instances where I’ve been surprised to find different applications for this old favorite. My first experiment with CrystalGel was using it in the creation of a cut drop for In A Forest Dark and Deep at the Contemporary American Theatre Festival. 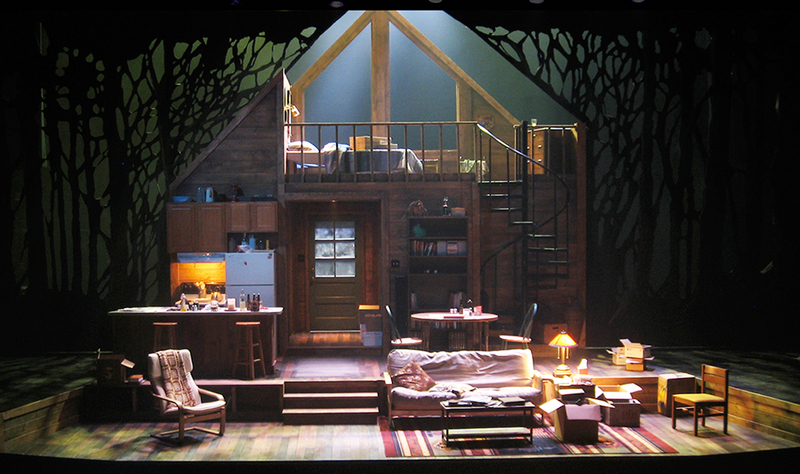 Scenic Designer, David Barber, designed a beautiful cut drop of tree silhouettes that fit around the roof line of a wooden two-story cabin on stage. Initially, the intent had been to use black velour for the drop, but we ended up using duvetyne as the base material instead. Since the duvetyne was much thinner than velour I needed to find a way to stiffen the fabric so that the image wouldn’t sag once we cut into the drop. The design of the cut sections was well thought out though, so instead of using scenery netting on each little hole, we decided to spray the back of the drop with CrystalGel to stiffen it. 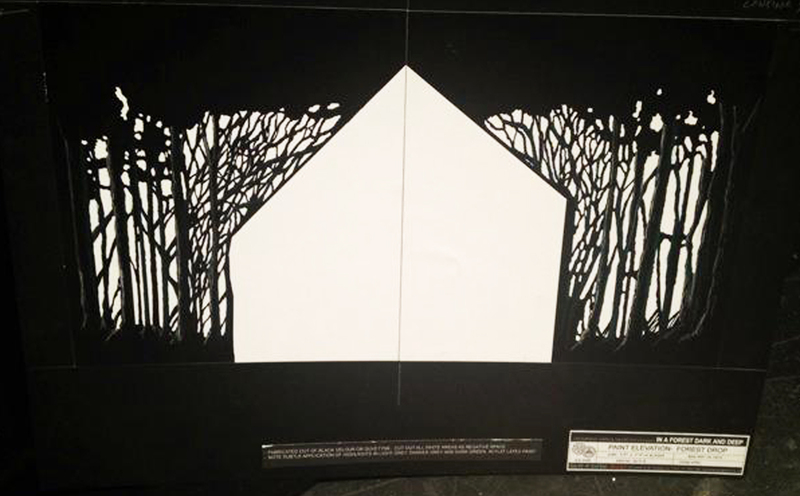 Once the back was stiffened and dry, we projected the design onto the front and used good sharp scissors to cut out the negative space. The CrystalGel was just stiff enough to hold the shape of the fabric, but flexible enough that we were able to manipulate the drop and cut through it easily. 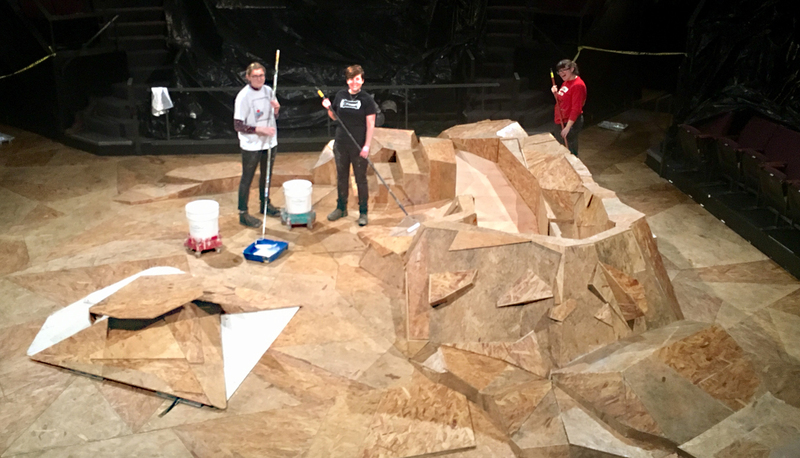 For a production of Little Bunny Foo Foo at Actors Theatre of Louisville, our scenic designer, Laura Jellinek, imagined a series of OSB geometric mounds across the stage. 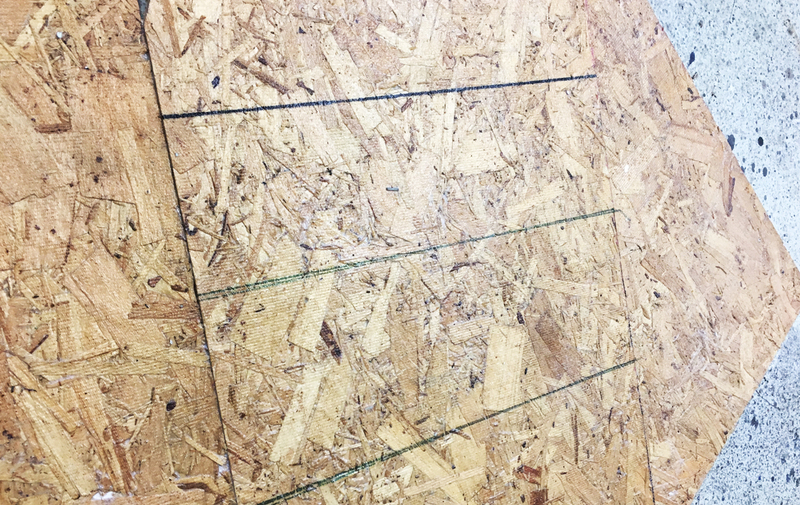 The production called for both the adult & child actors to climb and slide all over the set, so the paint shop was tasked with figuring out how to make the OSB a safe, splinter-free surface. 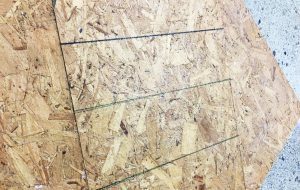 Our designer loved the look of the raw material, so we needed to find a product that would act as a barrier against the rough surface yet be practically invisible. Knowing that it dried clear, my mind went directly to CrystalGel. It took us a few samples to figure out how many layers we would need to guard against splinters. In the end, we determined that two thick passes of the coating provided the protection we needed without distorting the look of the material. To avoid splinters even more we waited until the mounds were totally assembled to coat them, so we could coat all of the raw edges. The only downside to the CrystalGel in this case was that it dried with a glossy sheen, which went against our designer’s wish to have the material look totally raw. We were easily able to tone down the sheen, however, by coating the CrystalGelled mounds in Rosco Clear Flat Acrylic. Not only did the CrystalGel do a great job pf protecting our little Field Mice’s hands and knees, but it held up the whole run and we never had to touch any of it up – which every scenic loves! My most recent CrystalGel experiment was to figure out a way to wrangle the messiest material out there – glitter. 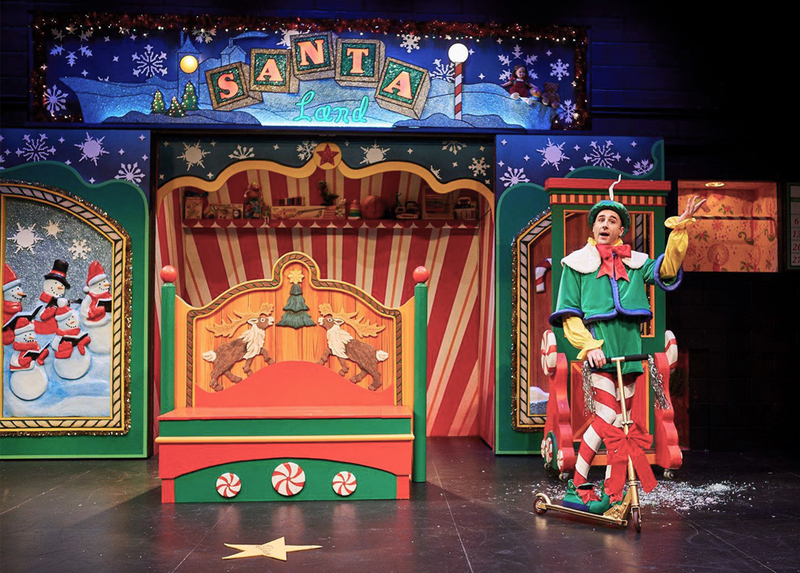 When I first received William Boles’ scenic design for The Santaland Diaries at Actors Theatre, I knew my shop was about to be covered in sparkles for the next few months. 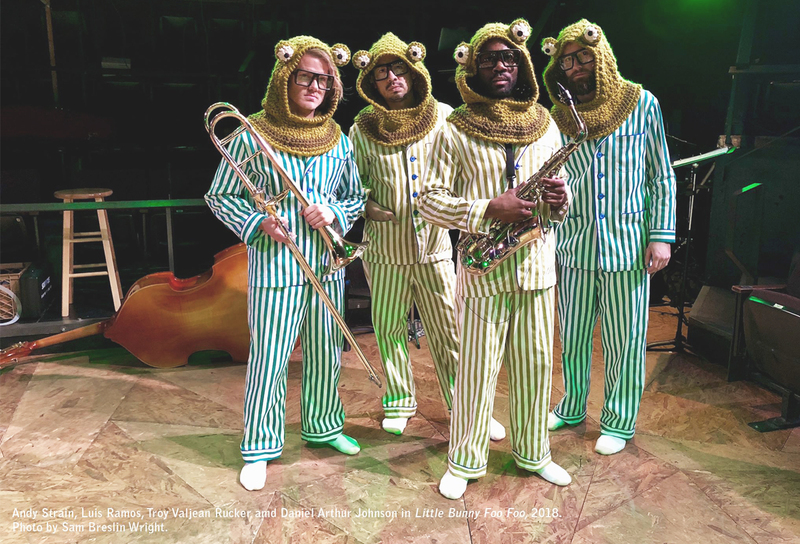 This dynamic set was almost totally covered in varying shades and sizes of glitter – all of which had to last. I know Rosco recently blogged about this technique for costumes and props, but I wanted to share how well it works for scenery! Because we were building this set to remount every year I needed to figure out a way to coat each piece in glitter, yet not have it flake off, as it is wont to do. I’d put glitter into sealer before, but, for the amount we were applying, that wasn’t going to give us a heavy enough broadcast. My Assistant Charge, Colleen Doty, suggested that we mix the glitter in with CrystalGel to create a paste and then apply that to the MDF substrate. It worked amazingly well. In addition to gluing the glitter to the wood it hardened perfectly and not a single flake came off during transit or the run of the show! A year later and the set is still looking as flashy as the day we finished it. 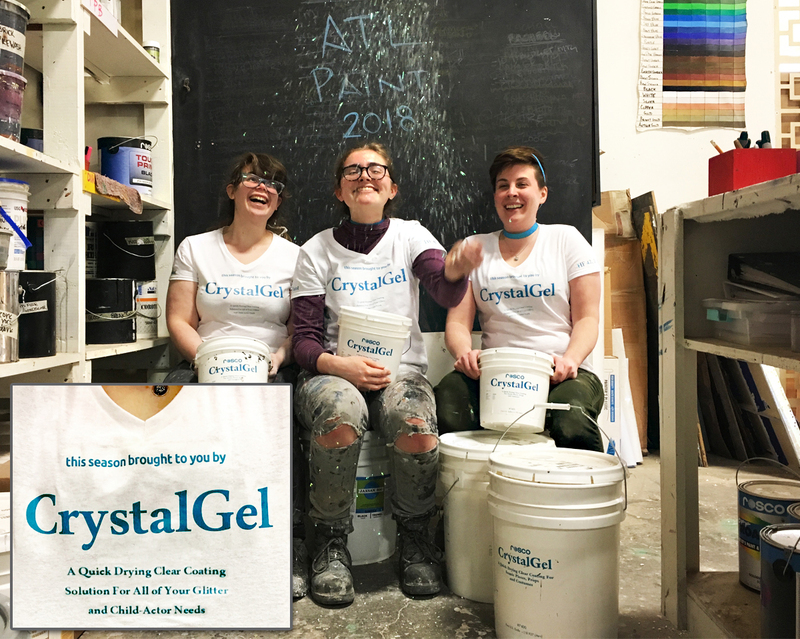 Have you come up with any new ways to use CrystalGel in your work? Tells us about them in the comments. If you would like to learn more about this versatile coating product, please visit the CrystalGel product page on our website. 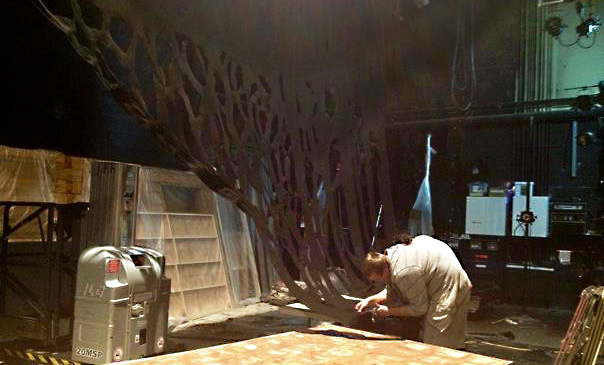 Rachael Claxton currently serves as the Charge Scenic Artist for Actors Theatre of Louisville and is a proud member & board secretary of the Guild of Scenic Artists. To see additional examples of her marvelous scenic art, visit her website – www.rachaelclaxton.com. 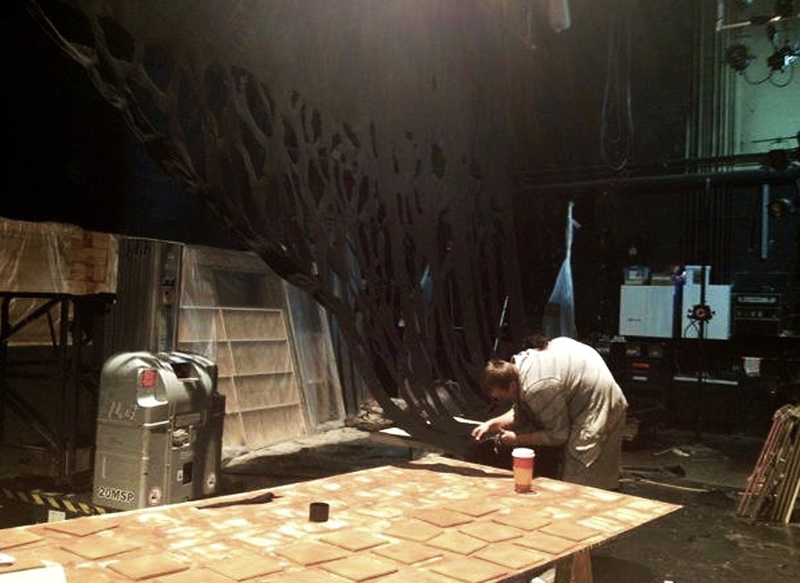 A Founding Member of The Guild of Scenic Artists, Angelique Powers has an MFA in Scenic Art Design from the California Institute of the Arts and has been professionally painting theatrical scenery for over 16 years. Angelique also shares her knowledge, passion and experience with her students at the University of Minnesota as a scenic paint instructor. To see Angelique’s work, be sure to explore the portfolio on her website – Qpowers.com.